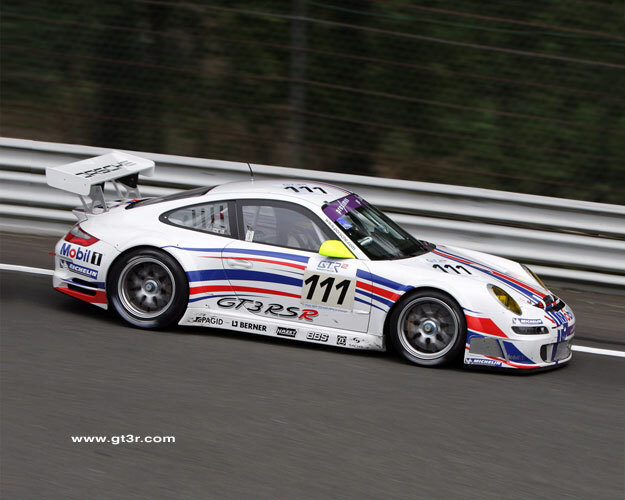 "Based on the current 911 GT3 RS, a particularly light and sporty derivative of the 911 GT3, the new GT3 RSR is designed to comply with the A.C.O (Automobile Club de lOuest), the FIA-GT and IMSA (International Motorsports Association) as well as VLN (Veedol Langstrecke Nuerburgring) regulations. 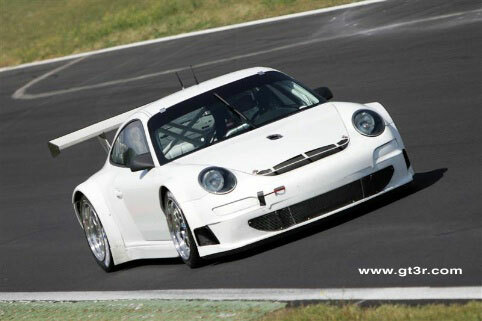 Porsche decided to build the new GT3 RSR after analysing the A.C.O. and FIA regulations in a specification which allows a minimum weight of 1,225 kilograms (predecessor: 1,125 kgs) and permits the tyre width to be increased by two inches to now 14 inches. 35 kilograms of the required additional weight may be placed as ballast in the vehicle, contributing to a lower centre of gravity. For the normally-aspirated Porsche engine this specification allows a capacity of 3.8-litres with two 30.3 millimetre air restrictors (predecessor: 3.6-litres, two restrictors with 29 mm diameter). The increase in displacement was achieved through the enlargement of the bore to 102.7 millimetres with the unchanged stroke of 76.4 mm. With the mandatory air restrictors, the unit delivers 359 kW/485 hp at 8,500 revs per minute. Maximum torque increased to 435 Nm. Top engine speed is reached at 9,000 rpm. Thanks to the increase in capacity and the corresponding reprogramming of the electronics the top performance as well as the response and driveability have further improved. The efficiency of the mid-front radiator was increased while the radiators flanking the centre unit on each side are the same as in the high performance Carrera GT. 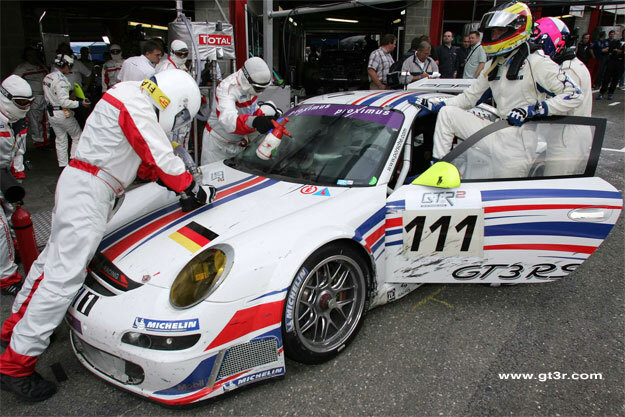 The latest GT3 RSR features the proven sequential six-speed gearbox with ignition cut of its forerunner. 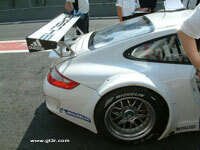 The bodyshell of the GT3 RSR with the welded-in safety cage is ten percent stiffer than its predecessor. Distinctive wheel arches widen the body by 50 millimetres on each side. The track is enlarged correspondingly; wheels and tyres of the maximum allowable dimension can be fitted. The relocation of the supplementary oil tank (option), the power steering and the battery to the front improve the weight distribution. The front and rear lids, the front mudguards, the wider rear, the doors as well as the front and rear panelling and wing consist of carbon-fibre composite material. The rear and side windows are manufactured from light polycarbonate. The newly-developed aerodynamic package improves the aerodynamic efficiency compared to the forerunner (type 996 GT3 RSR) by around seven percent. Airflow to and from the radiators, the brakes and the engine were further optimised. In compliance with the FIA and A.C.O. 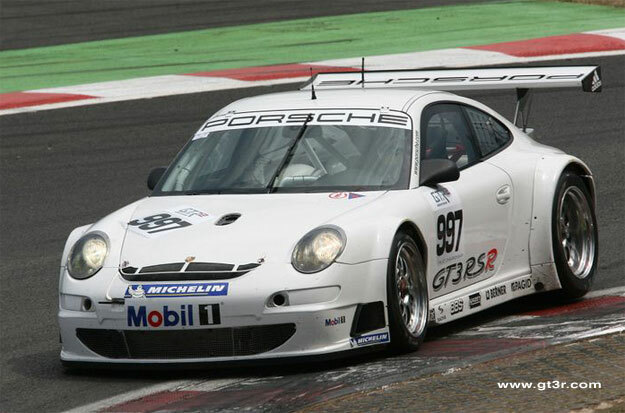 regulations the new GT3 RSR features a flat underbody. The suspension with Porsche-optimised struts at the front and the Porsche multi-link axle at the rear corresponds to the configuration of the standard car. The modified kinematics are set-up for the wider tyre footprint and for the lowest possible camber change in rebound and compression. The new ZFSachs shock absorbers feature the Through-Rod-System with considerably lower chamber pressure and hence less friction than conventional dampers. As a result they offer a significantly improved response characteristic. The position of the rear axle was optimised. The axle features a new anti-rollbar, an adjustable upper link and an optimised lower link. The brake system features six-piston aluminium callipers and 35 millimetre thick brake discs measuring 380 mm in diameter at the front and 30 millimetre four-piston aluminium callipers with 355 mm diameter discs at the rear. 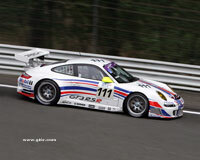 Over the 2006/07 winter, 35 units of the new racing sportscar will initially be built." 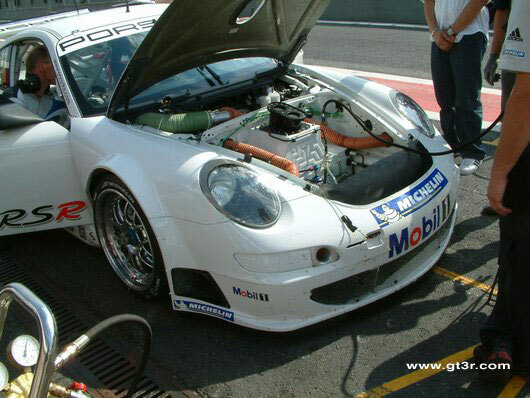 In testing before the Spa 24 hour race. Interior shot shows Sascha in the seat. 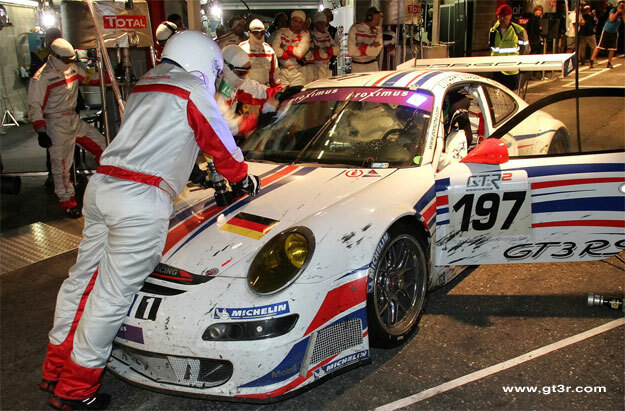 Race trim shown in pictures below. 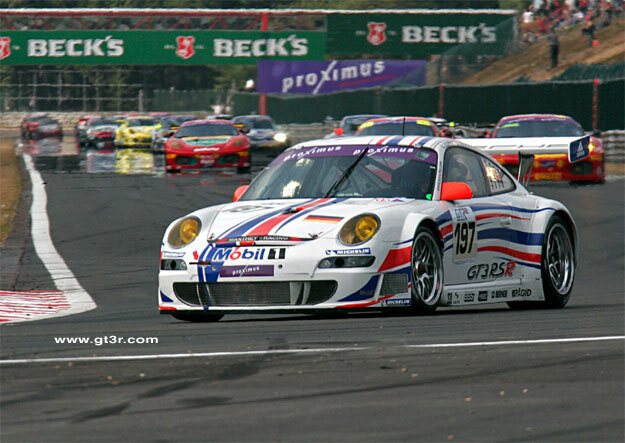 As with LeMans in 1999. 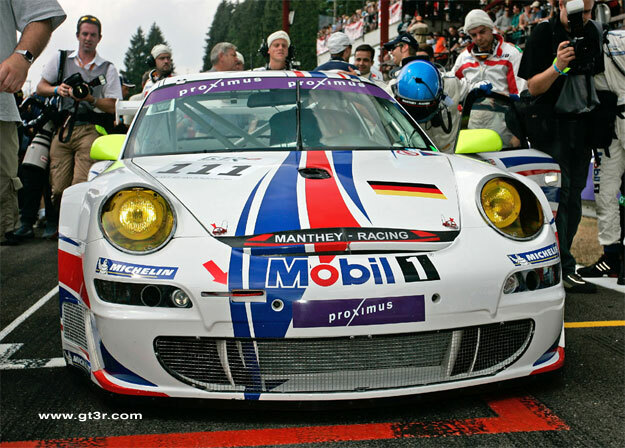 Manthey was the entrant and 2 cars made up the team for the 24 hours of Spa.